I first read is book years ago, I noticed the title and the cover in the supermarket and flung it in the basket quicker than you can say book. I say I first read it ages ago, meaning I have reread it since then and I have reread it just recently to give it a proper review as I would strongly recommend this book to and chick-lit fan.The story is about Ella Buchan, a make-up artist to the stars who has found herself on the set of a new film which is set to be a Hollywood success for director Hayden. Also on set is the gorgeous Rory Defoe, the film’s resident Hollywood bad-boy whose reputation hasn't gone unnoticed by the financial backer Anton. The story is told from Ella's point of view as she has to contend with Rory and his lackadaisical attitude. His flagrant disregard for the rules set down by the director mean that the film's future is uncertain.I really loved Ella, I loved her role as make-up artist and the description Louise used shows how well the job was researched - at the end of the book in the acknowledgments Louise thanks several people for letting her onto a real film set to see how it's all done. I think a sign of a good book is when you can imagine yourself in the place of the main character, this defiantly rang true for me here. Rory is the typical good looking, charming bad boy. He has women falling at his feet and exudes more Hollywood than Hollywood itself. His relationship with Ella starts out well but as Ella becomes embroiled in a plan to save the film their dynamic totally changes. I really love this book and as I've said I've read it more than once. I would definitely recommend this to fans of Paige Toon but also fans of hunky book boyfriends! I came across this book from Sophie Kinsella's updates on her Autumn Reads..the synopsis of the novel caught my attention. When I look for it here in Goodreads, I knew I had to read it. I was so into wanting to get my hands on it that I couldn't think about anything else other than reading this novel. 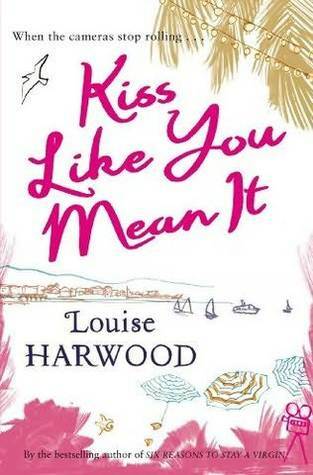 I didn't have the mood to read any other book until I've read Kiss Like You Mean It. It was really absorbing. I love everything about it. I can imagine myself reading this at the beach. It's a perfect beach read. I will not give away any spoilers. i totally love this and I could hardly put it down. I read this book whilst I was on the beach. I managed to read this in one day as I simply couldn't put it down. I liked the twists that were in the book and I liked the characters, although I felt that the director should have been more dominant with certain actors rather than letting them do what they like. This book has many funny moments in it and you find yourself wanting the main characters to get together even though you think that she will just be used by him because of his fame and the fact that he knows he can get what he wants whenever he wants it. It was well written with an interesting plot. The ending suited the book perfectly and you couldn't help but smile. Read this one quite quickly, always a good sign. Being in the film industry, it was nice to see that Louise went into quite a bit of detail with the set scenes especially the makeup/hair world. I liked the tension between the two characters, although I'd have to agree with a previous review on the predictable ending. Still, a nice beach read with some laugh out loud bits. I'm never quite sure if I should feel guilty about liking easy reads. That's exactly what this was, read in a couple of days during a lazy weekend. The characters are all likable and you get the ending you want. What more could you ask for? As to insiders view of a film set... thumbs up. As to the perceived romance...thumbs down. I loved this book, require different but compelling read. Loved the characters and also so wanted to watch the film they were making. It was an good read won't spoil the story for everyone but whilst reading it was fairly obvious what would happen but it was a feel good read and worth reading.Good author too! Loved the book ! Loved the story ! One thing .. just some more romance and it would be fantastic ! !